This week, May 3rd - 9th, 2009 is National Teacher Appreciation Week. Today, May 5th is Teacher Appreciation Day. Teacher's everywhere need to be recognized for the hard work and dedication they put forth for our children. I, for one, certainly appreciate what they do and have done for my boys throughout the year! It takes a special person to do what they do everyday. God has blessed them with a gift and, now, it is our turn. Here's a very simple gift that any teacher, staff member or just about anybody would love! 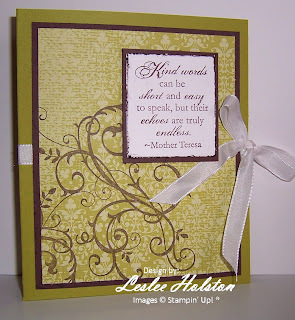 This note card set is quick and easy to make and the recipient will LOVE it! Here's the how-to...Score an 8-1/2" x 11" sheet of card stock at 5-1/2" on the long edge. Score at 2-1/2" on the short edge and fold that up to create a pocket. Adhere outside edges of pockets so that the note cards won't fall out. Fold in center. Wrap a length of ribbon around the folder to hold closed. 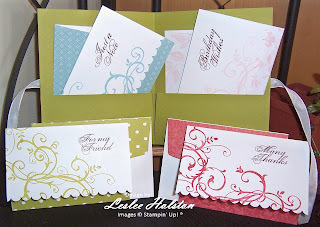 I've used Bella Rose Designer Series paper and Baroque Motifs to coordinate both the folder and the note cards. Of course, you can use whatever you'd like and you can embellish as much or as little as you'd like too. Teachers are always in need of thank you notes. It is something they really will appreciate receiving and will truly enjoy using. Let your child give you a hand in designing the note cards to make it even more special for their teacher. Please don't forget our fabulous teachers and para educators. Even if it is just a simple card of thanks. I hope you've been inspired to thank those that inspire the mind of a child. this is wonderful! I love it!